We had the pleasure to co-facilitate our webinar with two special guests: Nancy Erbstein from the University of California at Davis who spoke on her work in the area of Youth Participatory Action Research (YPAR), and Julian Sefton-Green from the London School of Economics & Political Science and an independent scholar who shared his diverse experience on who research is for and why to involve people. Here are some notes on the webinar. Nancy Erbstein got started with YPAR during her undergraduate work that related to educational reform, working with renowned researchers in the area and alongside Language Learners (L2). This is when she recognized the “disconnect between students’ experience and the discourse of the national school reform arena.” She wanted to bring the L2 youth voices to the conversation of policy planning and evaluation. Nancy’s experiences working in South Asia around nationalization of the Nepalese school curriculum with ethnic minorities also informed her YPAR work as it stands today. She developed a curriculum that was based on youth-led research and evaluation. With the creation of the youth-led research and evaluation planning curriculum, Nancy and her colleagues asked youth to research their own conditions and bring that activity to bear upon research and evaluation. A critique of the politics of knowledge production led her into this work. She also co-founded the nonprofit organization Youth In Focus to train young underrepresented people in youth-serving organizations to engage youth in Participatory Action Research (PAR), evaluation and planning. Julian Sefton-Green started with the intention of being a “proper academic,” but instead became a high-school teacher with a particular interest in media studies and media education. Training at an institution with a history of activist education he had the opportunity to work in and with schools. Julian mentioned that “at the time classroom teachers, along with heads and teacher advisors, had more influence about what happened in schools, especially in regards to assessment and curriculum.” Working with a community of practitioners developed his wish to find ways to theorize the challenges he experienced when working with a community of teachers. While working with young equity advocates and people in decision-making and planning environments in areas including education, public health, youth development, community development, and philanthropy, Nancy engaged three communities in California: an underinvested urban community, a large town with formerly incarcerated youth of diverse sociocultural backgrounds, and a rural area with predominantly Latino youth. Nancy partnered with organizations to design and pilot an educational curriculum for critical use of public data, digital youth well-being analyses and online GIS systems. Most of the funding for this work came from the university campus, and private foundations. How to construct geo-spatial measures of youth well-being that would rely on publicly available data, and would provide analysis of sub-county level (US) that can be made available online through a GIS platform? How to build youth capacity to work in an informed and critical way with such analyses? What are the limits of policy makers in reading YPAR research? How do you get young people engage? The work Nancy was involved with “tied to issues that youth were already contending with”, and did not find it challenging to get youth involved. However, sustaining involvement can be challenge, as young people often have a lot going on in their lives. Another issue could be the need for youth to find work to support their family. As a way to counter this challenge, Nancy suggests offering stipends to young people, especially if their work was supporting the work of the institution. However, she warns that “in classrooms it can be more difficult to integrate this type of work where [youth] engagement is part of a course, but I’ve seen some remarkable successes.” One example of these success stories comes out of the Community To The Classroom project (video of an example produced by youth). Nancy experienced that “young people often want to discuss the dynamics of (…) power they are experiencing.” Here it is particularly important to support adults with the resources needed to open up lasting ways for youth to engage. What is the importance of theory? Nancy made an explicit decision not to be in a mainstream faculty position. At institutions all of the work it takes to pursue rigorous and mutually respectful, equity-oriented, community-engaged research is considered service. So much of her work-time does not directly focus on writing peer reviewed journal articles. In a non-tenured faculty position without a regular teaching load, she has been able to allocate time for community engagement but still work with students through projects and committees. One can be successful working in this line of work while being in a tenure-track positions, but it presents unique challenges, for example, it is often not an easy fit if you want an academic appointment that carries PI status; but this is changing to some extent. Groups such as CCPH and Imagining America are working to support such scholars and scholarship in the US. Is there a contribution that participatory and community based research can make to educational research? Megan Bang and Phillip Bell kindly participated in last week’s DML Commons Design-Based Research webinar on co-design and collaboration. They presented their rich experiences of closely working with research participants. how they established sustainable research/practice partnerships based on exciting networks, and how their work ties into the theoretical and practical considerations of DBR and DBIR. Through the presentation, Megan and Phil answered many of the questions we prepared to discuss. 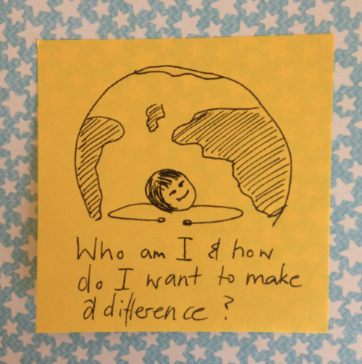 We wanted to share our questions to Magen and Phil here as a resource and starting points to consider when thinking about a design-based research project that commits to ethical and holistic participation. What are strategies for learning about context before engaging in design (e.g., initial observations of the context, development of partnerships, understanding and specifying partners’ goals)? What are strategies/tools for beginning and building relationships with participants? How do you co-construct the design process with participants? How did you begin working with your participants? What barriers/challenges did you face? How did you overcome them? How do you negotiate and document decision making in design-based research? How do you share your data collection, data analysis and design practice with participants? What happens when participants are resistant to change, or go in a direction that you might not think is in the best interest of kids/young people? How do you sustain the project and participation (handover to participants)? How long should/could DBR go on for? How do you know when to continue and when to stop? How do you plan for how intensive and long the process will be? My aim for the Spring 2015 was to practice public speaking. It seems like quite many opportunities were made available through conference presentations, webinars, workshops etc. The journey has been a huge learning curve and a lot of fun at the same time. 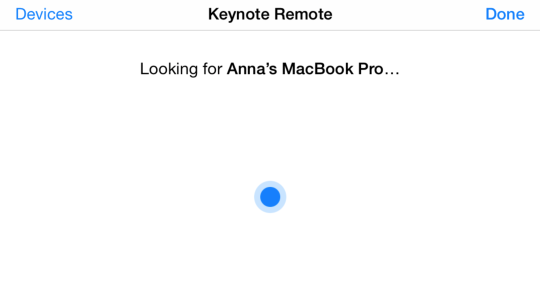 I’d like to share a short reflection on my experience, by focusing on my discovery of the Keynote application as a helpful tool. At the recent AERA conference in Chicago, I had the chance to present research I have had the pleasure to work on with Dr. Karen Wohlwend and Dr. Kylie Peppler. The work relates to the design of a new curricular model for making that helps facilitate and reverse approaches to making in holistic ways: the Design Playshop Model. This was my first AERA presentation and my first US conference presentation ever! I was super excited and also pretty anxious to get it all right. Our work was a qualitative study and included many cases to illustrate orientations to making and how the merging of orientations deepened and broadened children’s engagement with making. At the same time, my presentation was only supposed to be 12 minutes long. In this short time, only some salient examples could be shared. Open Keynote on the computer and on the iPhone while being connected to the same wifi on both devices. Let the app find the computer. Once it computer and phone are connected, you can click play. 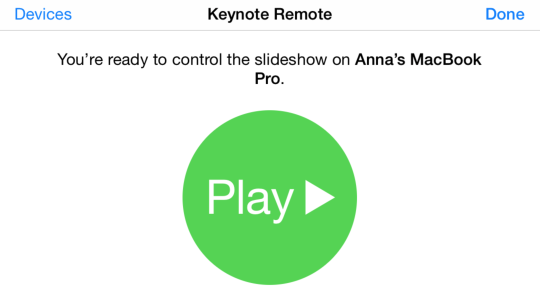 The presentation starts on the computer, and as you swipe the phone the slides change on the computer. I set the phone view to display the current slide plus notes, but other views are possible too (e.g., next slide + notes, just current slide etc.). The current slide plus notes made me feel comfortable presenting and allowed me to better engage with the audience. I was flexible to move and had the option to glance at my notes without appearing as if I was reading. One big plus was that the AERA wifi was so reliable! Participants: Bill Penuel, Professor of Educational Psychology and Learning Sciences at the University of Colorado Boulder. 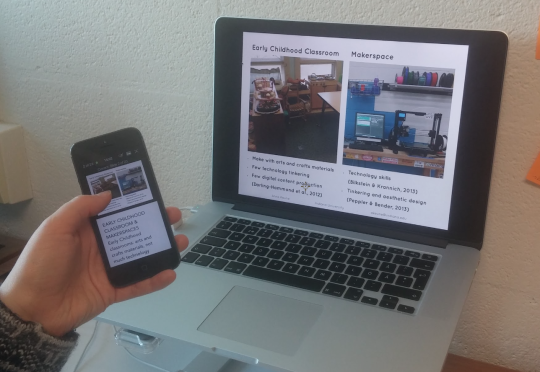 The first webinar of the Design-Based Research strand focused on the goals, purposes and argumentative grammar of design-based research, and presented design-based implementation research as a nuanced approach. Here my take aways. Design is always a political act, even if it is not explicitly stated. We have to ask: Who is at the table? Whose future is valued? Listen to the classroom setting and the questions that are emerging. Iteration and changes of direction are common. 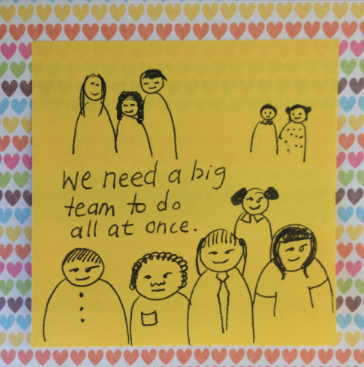 You need a big team to address all purposes at once. Take things off the table. Apprenticing with experts who are skilled and have experience in the kinds of research can be invaluable experience. DBIR is always a collaborative effort. Design-based research studies interventions, how the intervention is designed (and evolves), and how that intervention supports the intended outcomes of the design. Doing design is a way to learn about learning, and combining design and research given the opportunity to study learning and to create the structures for supporting learning. One example would be the creation of an innovative way of learning a particularly difficult concept at an earlier age than it was possible before the innovation. Design-based research develops local and humble theories that are closely tied to the specific context of the design-based research intervention. Humble theories can relate to learning and design. For example, Through the active and interventionist engagement, design and implementation of innovations in real world settings, such as classrooms, researchers can get better understanding of how learning is done in this context. This gives that an opportunity to develop, for example, local theories of learning. At the same time, a close look at how design was organized in this context can reveal a better understanding of theoretical perspectives about design. Design-based research give knowledge about implementation. Particularly design-based implementation research focuses on how to anchor, scale and sustain design-based research innovations across a wide range of contexts. Studying adaptations can provide knowledge on how to implement design-based research before, during and after the fact. Panuel and his students are working on a theoretical perspective of how to organize collaborative design within design research, including to what extend collaboration supports teacher’s agency. One question includes: How should design be organized to expand teacher’s agency on what they may be able to teach? This might change how we see the the metaphorical notion of design, introducing organization as a new way of looking at design-based research. Argumentative Grammar refers to the notion of the logic that guides the use of a method and support of the data it provides. This does not relate to the strength of an argument, but rather something related to your methodological approach that can be isolated from context and can be appreciated by anyone outside of your field of research. The argumentative grammar of design-based research has not been fully developed yet. It is a family of approaches that moves towards a set of standards and tools to help evaluate claims. This is meant when people say that design-based research is an evolving field. To help move this forward, Sandoval introduced the idea of Conjecture Maps. The idea is that researchers make their suppositions about learning as explicit as possible in the beginning in order to be able to backtrack how they are embodied in the form of the design created through design-based research. This is a way to critique theories and designs, as it leaves room for questions. The opportunities for critical conversation about the results of design-based research studies can help strengthen the argumentative grammar of the area of research. Penuel added the idea to brainstorm ideas of how designs may fail, that is how a design may be used in unanticipated ways that would not lead to the kinds of learning we were hoping to see as a result of the design. While we cannot anticipate all unintentional uses in advance, imagining some possible failures can help address possible biases towards ones own work. Yet another way would be to build on prior design work in a similar area. This can help knit the field closer together and form tighter justifications for why particular decisions were made. Design-based implementation research relates to the critiques on what it takes to scale an innovation. 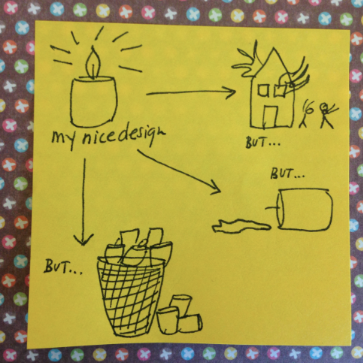 There are many different things that can come out of a design-based research project. Even if the project does not go well, one can share valuable insights. Further, there is no need to completely abandon the innovation. The idea here is to think about how to adapt the innovation and at the same time to consider how the context could be rebuild. DBIR shifts focus on design across levels (e.g., professional development, environmental factors, infrastructure etc.) and looks at what it would take for the innovation to be widely and effectively implemented. This systems look is considered to help see how innovation may fit, and what would need to change (in the system and/or the innovation) to make it work without compromising the essence of the original motivations. Rena Dorph, Director of the Research, Evaluation and Assessment Group at the Lawrence Hall of Science at University of California at Berkeley. Christo Sims, Assistant Professor at the Department of Communication of the University of California at San Diego. Funding, Methods, and Collaboration. Here a summary of them main points raised per topic. Planning for funding includes consideration of short term and long term funding cycles, and research trajectories. An opportunistic practice, funding can be sought in various places, including private and public foundations. In weaving together funding tapestry that spans across various research projects and interests, it is important to have a clear research agenda. This can help to keep an open mind towards non-traditional funding sources, such as contracting grants. Being prepared is another important aspect of funding. This may include having a robust set of written work to pull language from, or a set of literature references to draw on. An invaluable tool for this can be an organized and growing document structure or database that includes prior proposals, concept papers or needs statements that are written for various audiences. Further, institutional history and knowledge about past funding efforts and where to find traces of these can be another indispensable resource. Weaving all of this together, part of being prepared also includes relationships. One way to make networking more targeted is by connecting to people who have access to networks one might not have access to. There can be tensions between academic, political, ethical interests of researchers and funding agencies. These tensions can also be considered a reflexive approach, in which researchers choose to work on projects that reflect interests of funding agencies and provide space for researchers to pursue their own interests. However, funding is not the only way for researchers to make a living. It depends on the institutional position, set-up, and even the departmental structures on how important funding is: “Finding is not integral to all situations” (Christo Sims). Practice grant writing in graduate schools through opportunities including the NSF dissertation improvement grants. Applying and reapplying is a good way to learn to think about longer timelines of research. Apprenticeship model: involve yourself with people who are involved with grant writing, watching them and listening in. The professional pathways of researchers of getting to the established set of methods they apply most frequently and feel most comfortable with are diverse. Inspiration and past experiences are the building blocks for getting started on this journey. Here, an apprenticeship model can be useful as well. Having the opportunity to watch and work with more experienced peers, can help surface and clarify questions. While there are many different methods that can surface aspects about a phenomena, developing an understanding of the relation between theory and methods is perhaps more important than developing a methodological tool box and skill set. There are different theoretical stances people can take, and the theoretical stance shapes research methods and questions. Overall, an agility in relation to qualitative and quantitative work can help with funding and networking for funding. To refine ethnographic skills: Collaborate on taking observational notes during the same event, then compare notes to see how people can look at the same event and recognize different aspects of it. Follow up on this by writing a paper together and then one individually on how to approach and frame the work to see how different perspectives and different theoretical lenses may be applied. Collaboration can start by being part of a research team and offering one’s help to others with more experience. This can have build and accelerate experiences also in relation to methods and funding. However, at times different stances of collaborators can lead to conflicting approaches. While it can be difficult to bring different research identities together, acknowledging different ways of working and making room for diverse perspectives can be a productive way to move forward. When a single result is aimed for with a project (e.g., a book) it is more difficult to bring an multi-theoretical stance out as compared to talking. 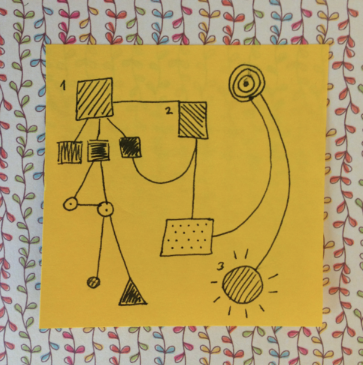 Taking a moment to articulate what everyone would like to get out of the collaborative effort is important to approach hierarchies of power within the collaborative experiences. One way to make the collaboration more dialogical is to ask particularly unpaid collaborators how their involvement could truly support their personal interests and goals. In efforts to make collaboration work, it is important to carefully consider whom to collaborate with and how. To have ongoing and fruitful collaboration, it is important to have some form of mutual understanding and appreciation of each other also in relation to the channels of communication. While some people prefer face-to-face work, other collaborative efforts can strive through online collaborative practices. Write about the theoretical stances of particular authors and how these may be productive for your work. One good way to facilitate sharing and an ongoing conversation before writing, is to share tasks among people and to facilitate periodical round table discussions that make room for sharing, exploring and commenting on stances.